This is the third of five trees in this group of maximum height 31.5m. and known as the 'Rest and Be Thankful' macrocarpas. 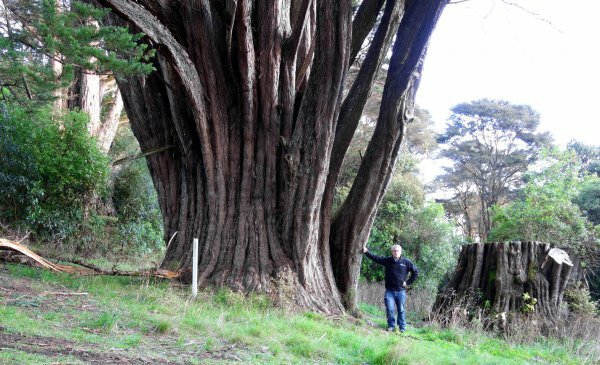 'These trees were planted in or around 1891 by Sophia Thornton on the establishment of her homestead at Maungakawa. This corner was also used as a resting place for horses and humans possibly in the development of the farm' (Cook 1996). Simon Cook has lodged copious notes and records which are held with the Registration RNZIH no.351a to e.
11 Aug 2014 Smillie, M.
16 Nov 1996 Cook, S.F. On the inside of the hairpin bend in the road and not easily missed.